To book me to speak at your school or library, please contact The Children's Bookshop Speakers' Agency. 'It was a delight to have Penny visit our preschool and introduce the children to her books. The children loved the way Penny taught them songs and rhymes and discussed the themes of her books. - Clare Steele, St John's Preschool, Ashfield. 'Children’s Ministers love it when they discover authors who engage the imagination of a child, introduces them to God and is liked by those both inside and outside the faith community. Penny’s books are enjoyed by our pre-schoolers both on Sunday mornings at church and during the week at our playgroups. Our playgroup parents and children encountered a speaker who engages people of all ages and stages and introduces them to our loving God with fun, interactive storytelling. We very much enjoyed having Penny visit our school. It is so rare to find an author who can engage and entertain our youngest students whilst still sharing their journey as an author at an appropriate level for all. Speaking to students from 4-8 years old she captured their attention and enriched their experience of her books. Her presentation was interactive and showed a clear knowledge of her audience. The readings and stories were interspersed with finger games and rhymes to allow little bodies who can't sit still for long periods of time to get up and be involved but without losing focus. The materials on her website were extremely useful before and after the presentation to reinforce concepts and add to the students' enjoyment of the day. - Sara de Horne, parent, Southern Highlands Christian School. 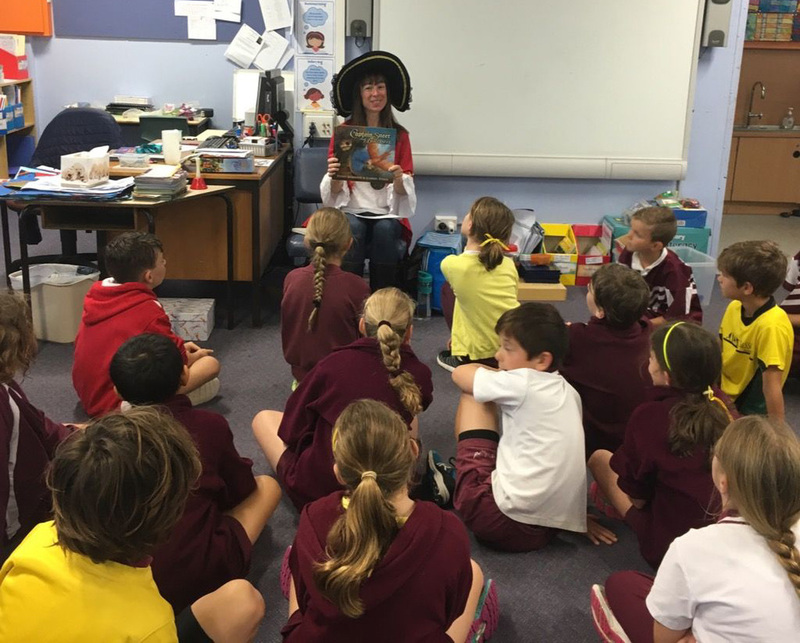 Penny visits primary schools to give fun, interactive talks to classes or larger groups about her work as an author. "I attended Penny Morrison’s inspiring workshop, ‘Writing for children’ at a Writers’ Conference last year. I thoroughly enjoyed learning new concepts and came away awed by all that is involved in producing a quality children's book. The practical activities were fun and Penny’s friendly, approachable manner made it easy to ask questions. Penny’s love for and understanding of children came across throughout her session. I came away full of new ideas and the knowledge of how best to carry them out. Penny is clearly a gifted children's writer with the ability to communicate and pass on her knowledge, experience and enthusiasm." 'Penny’s Picture Book Writing Workshops are presented with enthusiasm, purpose and humility. Penny is successfully able to combine elements of the theory of writing picture books with creative and practical exercises specifically designed to solidify participants understanding of this specific type of book. Her mix of theory and practice is intertwined with personal examples and aspects of Penny’s own writing journey creating a thoroughly encouraging and engaging experience for all participants. Penny also loves doing Bible talks for church groups.